When your turn begins, gain 1credit if you have at least 2link. 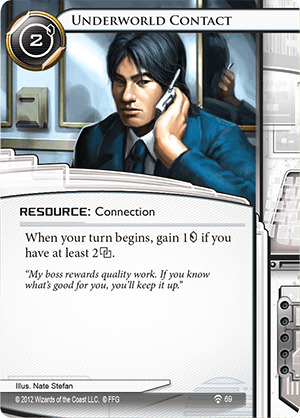 This card is best used with Runners that begin with 1 and are utilizing -boosting cards such as Access to Globalsec, The Helpful AI, Borrowed Satellite, Dyson Mem Chip or even Rabbit Hole. Prime candidates (in my opinion) are Andromeda: Dispossessed Ristie, who has a better chance of installing the necessary cards early on and Kate "Mac" McCaffrey: Digital Tinker, who can install Dyson / RH for 1 cheaper. Nasir (and Shapers in general) should have the best chance of utilizing UC efficiently, since THA, RH and BS are Shaper, and they have access to The Toolbox, which turns on UC without support. Another honorable mention includes Iain Stirling: Retired Spook, who beings with 1 and has an ability that supports passive economy.